Are Ireland now the best rugby team in the world? Tony Johnson: Are Ireland now the best rugby team in the world? Ireland can now claim to be the best team in the world after producing a stunning performance that was brave, creative and relentless. They deserved the win and with it, they deserve to be seen as world rugby's best team even if the rankings don't agree. They were unbreakable. They were so resolute that you have to wonder what was in each and every one of their engines. It will be a long, long time before we witness a performance that brave. They were the better team. They had an answer to everything the All Blacks threw at them and they never panicked, never looked overawed by the occasion. As for the All Blacks, they were almost as good and that is something that will hurt. The word almost. 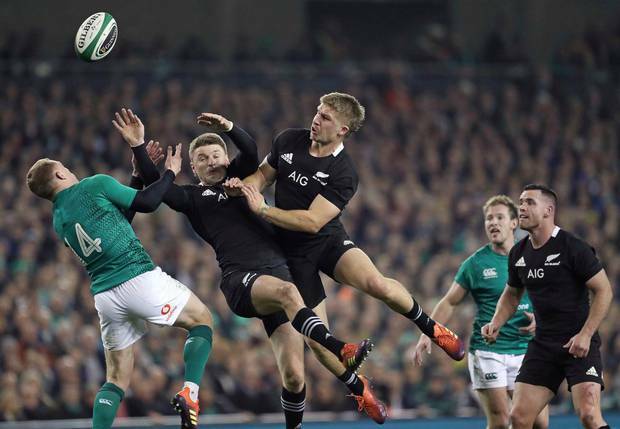 It's not normally there but the truth of things at the moment is that Ireland versus New Zealand is the great rivalry of the modern age. And maybe, just maybe, Ireland having won two of the last three can say they are edging it. They kept New Zealand try-less and that's something in itself that speaks to their quality. And talking of quality, it has to be acknowledged that this was the game of the season – a brilliant frenetic test, drive to an emotional frenzy by an atmosphere that was electric. What made it so special was the commitment. It's rare indeed to see two teams give such compelling defensive performances in the same game. Both flirted with being offside, but probably kept it just about legal for just about long enough and between them they barely missed a tackle. And when they did, their respective scrambling was so effective that whatever half chance had opened, disappeared with similar haste. The quality of the defence was partly forced by the quality of the attack as both teams moved at incredible pace and with definite purpose bobbing about, bustling here, there and everywhere frantically looking for a hole to open or some space to make itself known. 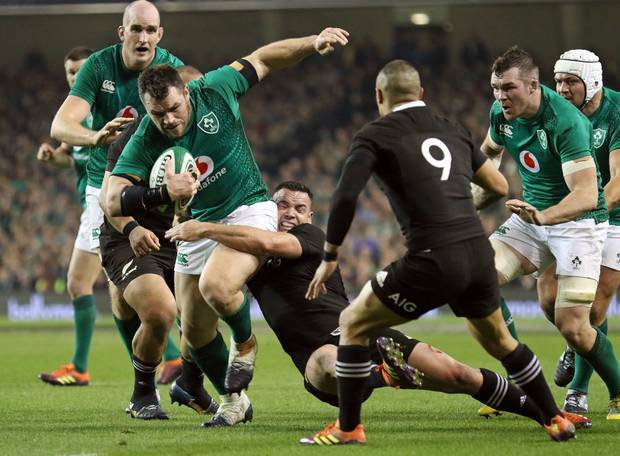 Ireland worked their wrap around moves off Johnny Sexton after their two props and big lock James Ryan did the damage crunching up the middle, while the All Blacks probed with their twin playmakers, Beauden Barrett and Damian McKenzie on either side of the ruck hoping to stretch Ireland one way then the other and break then somewhere. It hardly happened in the first half and it became apparent that the speed of the opening 40 minutes and the amount of effort both team had put in, that there was going to be a different ball game to be had in the second half. Or at least later in the game when fatigue had to bite and the contest had to start opening up. Patience was going to be the critical factor. Ireland weren't going to give up anything easily. They were going to scrap for every ball, give all they had to make every tackle and find a way to keep the All Blacks out. And if there was something the All Blacks didn't have it was patience. They were too eager to throw the pass that wasn't on. Too jittery when chances came their way. Kieran Read couldn't gather a charge down when the line was open. Barrett threw a pass back to an Irishman after he'd broken free. Reiko Ioane did the same and it looked like the pressure had got to the All Blacks. Ireland's relentless defence had unnerved them. They played like they were a little red in the head – not blue as they want to be in these big games. There was plenty of character about the way the All Blacks kept fighting to find that one break – that one moment that would give them what they needed, what they wanted, but just not enough composure and clinical edge. Ireland were able to take their one chance when Jacob Stockdale fired after his own chip ahead and Ireland victories really are like buses now – they waited 111 years for their first and two basically turn up at the same time.